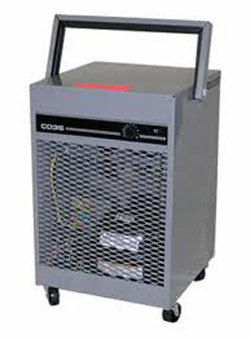 The Ebac CD35 Dehumidifier is an industrial unit designed to dehumidify areas of up to 500 sq ft and with a water extraction capacity of 17 pints per day at 80°F and 60% relative humidity. In higher humidity conditions this dehumidifier is capable of extracting up to 48 pints per day. A toughly built machine this unit will operate effectively in the harshest of conditions found in industrial settings, shops, storerooms, offices or in the home. The Ebac CD35 Dehumidifier is a compact unit measuring 12 x 12 x 22 inches, ideal for heavy duty jobs in smaller spaces. It resembles a room dehumidifier, for home use, in its general size and configuration but if you have ever wondered what makes an industrial dehumidifier different from a room dehumidifier try lifting it. Its 57lb weight may surprise you but what makes it heavier than a comparable room dehumidifier is the quality and robustness of its component parts. Why does it have such high quality parts? There are two reasons. It has to be durable to withstand the rougher environment of a work place. This accounts for a sturdy steel casing on the outside and robust parts on the inside. It has to be capable of effective and efficient low temperature operation for service in cooler places. This requires a better fan a better compressor and a better defrost system than a typical room dehumidifier. These characteristics are of as much benefit to a small business as to a large one. If your business is based in a workshop, for example, where you work alone, or with one or two others, a dehumidifier of this type is ideal to protect tools and stores from moisture damage, especially corrosion. If you experience low temperatures at certain times it is reassuring to know that the dehumidifier protecting your livelihood will work in those temperatures and do so dependably. The low temperature operating capability is possible because of a combination of components working together but the most important of these is hot gas defrost. Ice builds up on the refrigeration coils as temperatures fall below around 65°F degrading performance and eventually stopping the unit entirely until the ice has melted. Many room dehumidifiers are fitted with a sensor that detects ice formation and stops the machine at intervals to allow thawing before the ice covering becomes too thick. This is a partial solution but can only reduce the operating temperature of the unit to a little above 40°F. This may be sufficient for some purposes but if a workplace cools below this level something extra is required. Hot gas defrost, as fitted in the Ebac CD35 Dehumidifier is more effective, lowering minimum operating temperature to 33°F, and more efficient as it enables the unit to remove more water at these lower temperatures than a room dehumidifier. The Ebac CD35 Dehumidifier is configured for continuous drainage which is an advantage if the area in which the unit is located will be unattended at times. If a convenient floor drain is available this gravity fed system will be sufficient but if a condensate pump is required the CD35-P version is available with the pump fitted inside. There is a modest additional cost but probably less than the cost of a separate pump and certainly tidier and more convenient. Despite its weight this unit is portable and is fitted with caster wheels for movement across an unobstructed surface and a strong carry handle where it needs to be lifted into position. It also incorporates an adjustable humidistat which can be set for the level of relative humidity required and will maintain the chosen level without the need for continuous running. The unit simply cycles on and off as required thus reducing the energy consumed and its cost. The Ebac CD35 Dehumidifier will be of greatest interest to those who need an industrial standard dehumidifier for a smaller area of a work place. It may also be of interest to some home users who have a particularly tough area to keep dry, especially if it frequently becomes cold. A typical application would be to dehumidify a garage. The main disadvantage of this unit for home use is its cost but if you have a cold garage that houses an expensive or classic car and/or a large collection of valuable tools, this may be a unit you might wish to consider.